With 2018 rounding off we've had the pleasure of once again seeing the National Apprenticeship Awards arrive. Now in it's 15th year, the National Apprenticeship Awards celebrate outstanding apprentices and their employers who have both gone above and beyond. While the National Apprenticeship Awards celebrates apprenticeships overall across the country, the Asian Apprenticeship Awards celebrates the talent and diversity among British Asian apprentices, their employers and learning providers. 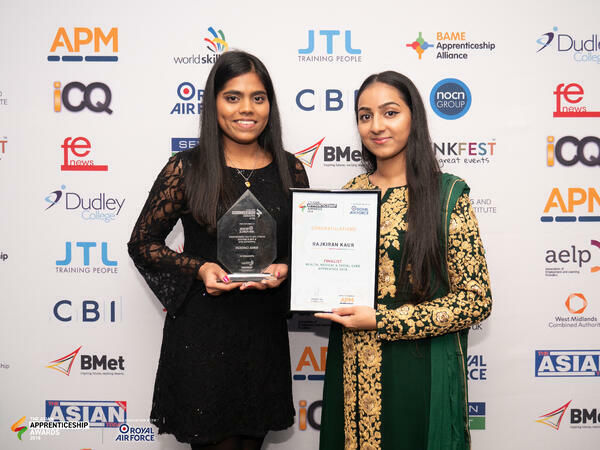 Of the 8 categories available, we were very excited to hear that 2 of our very own apprentices from Guy's & St Thomas' NHS Foundation Trust were finalists for the Charity, Voluntary Organisations & Public Services sector, Rajkiran Kaur and Sonia Cardozo! Rajkiran and Sonia were joined by 2 of our tutors, Wira Gitonga, Chris Thomas and over 500 other attendees at Edgbaston Stadium in Birmingham for the glittering awards celebration. 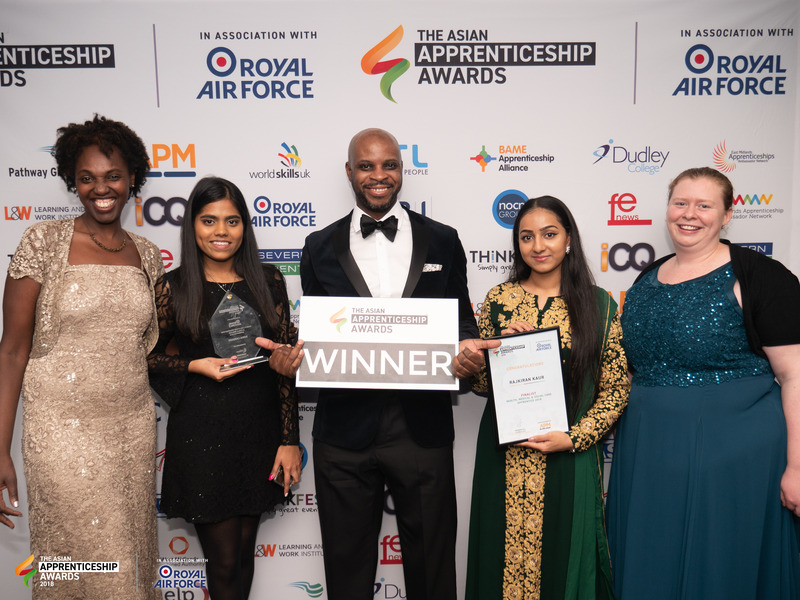 Guest speaker Jasmine Kundra, of the BBC's 'The Apprentice' kicked off the event with Sonia was crowned as Apprentice of the Year in the Public Services category! "Well done Kiran for your highly recommended nomination within your category, you have shouldered a lot during this year and you have triumphed through it all. Your inner strength has truly shown! Your exact words 'I 'm glad I enrolled into an apprenticeship programme, it is the best thing I have done since dropping out of uni' is an inspiration to everyone else that may take the same path into apprenticeships." "Congratulations to Sonia on your success and in taking the given opportunity and maximising it. You have come so far since starting out as a volunteer at St Georges hospital 3 years ago, keep doing what what you love!" "I cannot believe apprenticeships have brought me this far. I want to be a spokesperson for apprenticeships and tell everyone how amazing they are"
Further congratulations and thanks go to Guy's & St Thomas' who enabled Rajkiran and Sonia to learn, grow and achieve their very best.